(Dan Trimmer, 2004). Tetraploid (Tennyson X Raspberry Winter) 25” EM. Re. Ev. 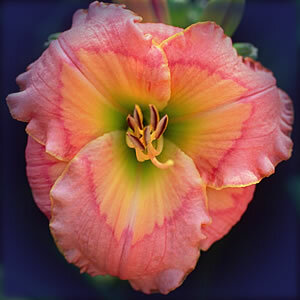 Over the past several years by far I’ve sold more RASPBERRY WINTER than any other daylily I’ve thus far produced. I describe PACIFIC MOON is the improved offspring of RASPBERRY WINTER with better plant habit, cleaner petal color, lower foliage and most importantly better coloration of the etched eye and throat. Often best described as a very “sweet” flower PACIFIC MOON is pale pink 4 ¼” bloom with a rouged pink triangular eye above a large glowing green throat.